This highlights the huge transformation in the role of ambulance crews over sixty years. Basic stretcher bearers with first aid training at that time, they are now highly trained clinicians diagnosing and treating patients at the scene rather than just ferrying them to hospital. In 1948, various fleets were operated by hospitals, the Red Cross, St Andrew’s Ambulance Association and the National Coal Board. 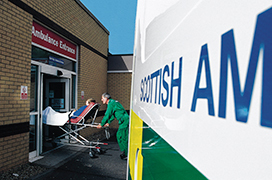 The Scottish Ambulance Service (SAS) came into being in 1974. Four years later it was made a special health board. Every year, the SAS responds to more than 500,000 calls and it also runs the air ambulance fleet – established by the state-funded Highlands and Islands Medical Service before the advent of the NHS. Early treatment of patients at the place where they have a heart attack saves lives.